A few classes that I'm teaching. (grrr...my website can't be updated at the moment, so I'm telling you here). 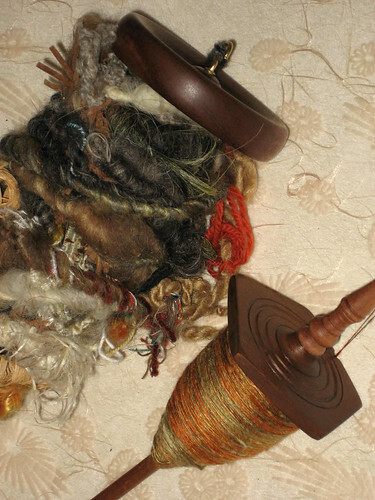 Learn to spin funky, artful yarns on a spindle. 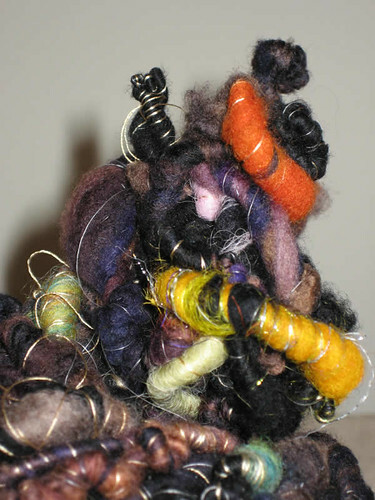 Start with spindle basics, then explore different fibers and how they can be used to create offbeat yarns. If you have tried spindles before, try them again in a playful environment with an artist who has created yarns of every imaginable type. Note: Please register by 3PM, Friday April 9. The Eliot School doesn't handle registrations after that point. If you want to register after that time, either email me (lindaATstoneleafmoon.com) or just show up, prepared to pay for class (cash or money order). For ages, people have combined leftover fabrics into crazy quilts, making beautiful assemblages embellished with embroidery. In this workshop, you will complete either a ten-inch square that you can incorporate into a larger quilt at home or a small child-size quilt.